The demonstrator craft spent nearly 20 hours in space before landing in northwest China’s Inner Mongolia region at 0741 GMT (3:41 a.m. EDT; 3:41 p.m. Beijing time) Sunday, the China Manned Space Engineering Office said in a statement. 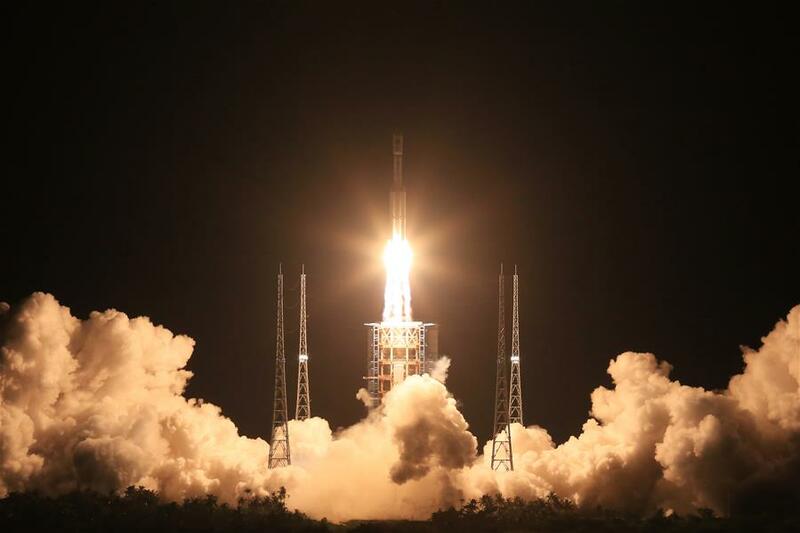 The capsule was one of several experimental payloads launched Saturday on the maiden flight of the new Long March 7 rocket, which deployed the spacecraft in an orbit as high as 235 miles (about 380 kilometers) above Earth. 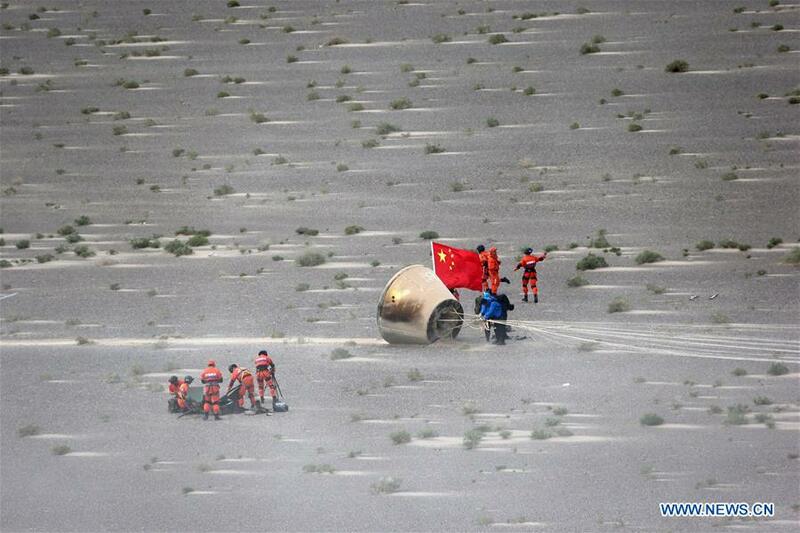 Pictures of the landed capsule released Sunday by Chinese state media showed the capsule on the barren Badain Jaran Desert surrounded by a recovery team clad in orange suits. A Chinese helicopter was shown landed nearby. 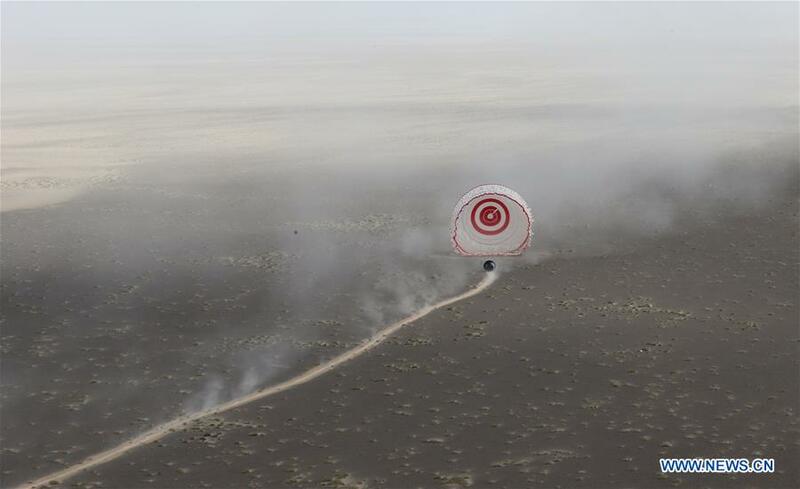 The capsule’s main parachute apparently dragged the craft some distance across the desert floor, but teams recovered the vehicle in good condition, officials said. 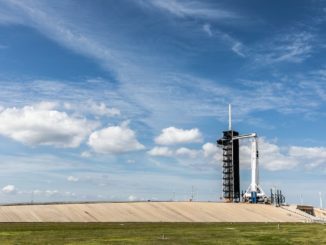 The sub-scale model flown this weekend has a height of about 7.5 feet (2.3 meters), a base diameter of 8.5 feet (2.6 meters), and a mass of about 5,730 pounds (2.6 metric tons), according to CASC, the architect and prime contractor for the Chinese space program. Flying for the first time, the testbed capsule “was designed to collect aerodynamic and heat data for a re-entry capsule, to verify key technologies such as detachable thermal protection structure and lightweight metal materials manufacturing, and to carry out blackout telecommunication tests,” the China Manned Space Engineering Office said. While the Shenzhou spacecraft can accommodate three astronauts, the new spacecraft could carry larger crews. Chinese officials have not said when the new crew carrier could be ready to fly with astronauts. The re-entry probe carried sensors to measure pressures, temperatures and heat flow data, according to the China Aerospace Science and Technology Corp., or CASC, the chief architect and prime contractor for the Chinese space program. A statement released by the China Academy of Launch Vehicle Technology, a subsidiary of CASC, said an experimental upper stage named Yuanzheng 1A was also successfully tested on the Long March 7 launch. Described by state media as a “shuttle bus” between different orbits, the re-ignitable stage can operate in orbit for up to 48 hours and fire its engine many times. The Yuanzheng 1A upper stage was designed to put its payloads into several different orbits. 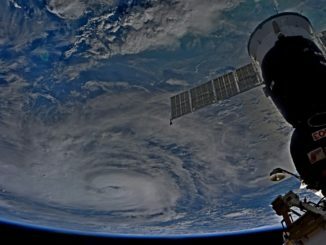 China’s official Xinhua news agency reported its passengers included a craft named Aolong 1 to test techniques to clear space debris, two small Tiange data relay satellites, a CubeSat to study Earth’s gravitational field and space radiation, and an experiment to investigate satellite refueling. Tracking data from the U.S. military indicated several objects attributed to the launch in three distinct orbits, all less than 370 miles (about 600 kilometers) in altitude. 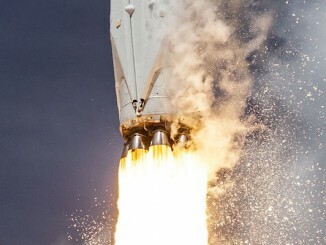 The Long March 7 — the most powerful Chinese rocket in history — blasted off Saturday from a new spaceport on Hainan Island. The launcher is powered by new engines burning rocket-grade kerosene and liquid oxygen, a more environmentally-friendly mix of propellants than used on China’s existing Long March boosters. In a statement on its website, CASC said the prototype capsule tested on the Long March 7 mission lays the foundation for a new human-rated spacecraft, which will incorporate new design elements such as a different aerodynamic shape from the Shenzhou capsule. The future spacecraft could also be reusable and fly with new metallic materials and a detachable heat shield, CASC said. China’s next piloted spaceflight is scheduled for launch in October, when the two-person Shenzhou 11 mission will lift off aboard a Long March 2F rocket to rendezvous with the Tiangong 2 space lab. The Tiangong 2 research module will launch in September on a separate Long March 2F rocket, serving as a pathfinder for China’s space station set for completion around 2022.